The DCI World Championships went south in 1979, visiting Birmingham, Alabama's Legion Field for the first of two years. With a score of 93.55, the Blue Devils became the highest-scoring DCI corps in history. In comparison, that score would have taken seventh place at the 2014 DCI World Championships Finals. Second place went to Phantom Regiment, who came within a tenth of a point of tying the Blue Devils in the Prelims competition. In fifth place, Revere, Massachusetts' 27th Lancers surged off the starting line with Ralph Vaughan Williams' "English Folk Song Suite." Published in 1923, it's the composer's best known work for English military band, an ensemble comprised essentially of the same instrumentation of today's indoor symphonic bands. Opening with an explosion of flag twirling even before the music began, the color guard members performed a quick sequential spin routine around a deep arc up front, igniting the spirit of the audience. The horns and flags then deftly rotated two large arcs on either side of the 50-yard line, impressing all with how well the moving forms remained symmetrical over the curved pathways of each individual. Next was a brief drum break that led into "Open Wide" from the Don Ellis Orchestra's 1977 album, "Live at Montreaux." This was Ellis' final band recording before he tragically died of a heart defect at the age of 44. The album was recorded at the famed Montreaux Jazz Festival on the shores of Switzerland's Lake Geneva by a rather large band of 23 members, including two basses, two drummers and a string quartet. The following production was the theme and other selections from "On the Twentieth Century," from Cy Coleman's comic opera Broadway musical of 1978. 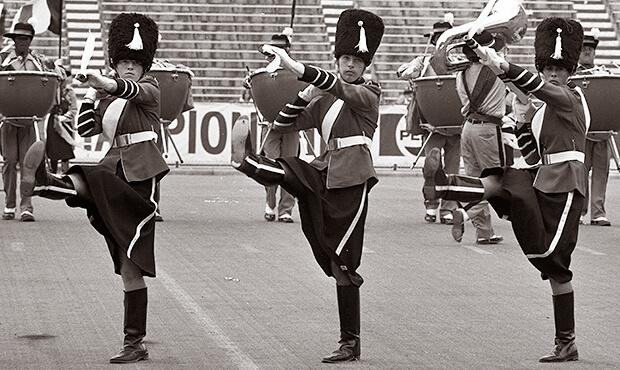 During this piece, the rifle line performed a spin routine while lying on the ground; something the line had popularized over the prior few seasons. The flags were now doubled on both ends of the poles. The corps' percussion feature was "Take Five" by Paul Desmond, saxophonist for the Dave Brubeck Quartet. The combo recorded the piece on their 1959 album, "Time Out." Written in the then-unusual meter of 5/4, it is noted as the best-selling jazz single ever. The horn line, minus the contras, held swing flags that were the same design and colors as the guard's large flags. Starting in a single line on the 50, the horns spread out to a large box and then rotated back into a single line. After the horns moved off to the sides, the rifles moved to the 50 and the flag bearers lined up on both sides, twice tossing their flags to the others through the spinning rifle line. As expected, it was one of the most memorable visual moments of the season. "Danny Boy" closed out the show. The corps' beloved theme was based on the traditional Irish standard and played to the music of "Londonderry Air." Englishman Frederic Weatherly wrote the lyrics in 1910 to a different tune than what we now know, and the song itself was a commercial flop. In one of the great kismet moments in popular music history, his sister, who lived in America, sent him "Londonderry Air," an Irish tune she had found. He altered his poem to fit the new melody, the new version of the song took off, and the work became a de facto anthem of the Irish and one of the most recorded songs in history. The 27th Lancers horns and drums moved to the right side of the field, with the flags encircling the entire form and the rifles lined up perpendicular to the diagonal line of horns and drums. The entire form rotated as one of the horn players and percussionists split apart to allow the rifles through, with both the rifles and the flags spinning while lying on the ground. The corps' 1979 show was seen on the live PBS broadcast of the DCI Finals by Tommy Walker, who was charged with putting together the opening and closing ceremonies for the upcoming 1980 Winter Olympics in Lake Placid, New York. He was so impressed with what he saw, and knowing Massachusetts was within driving distance of Lake Placid, he invited the corps to participate in the Winter Olympics to be held toward the end of February. A week after the end of the Olympics, the corps was invited to the Massachusetts State House to be honored along with the state's Winter Olympians. 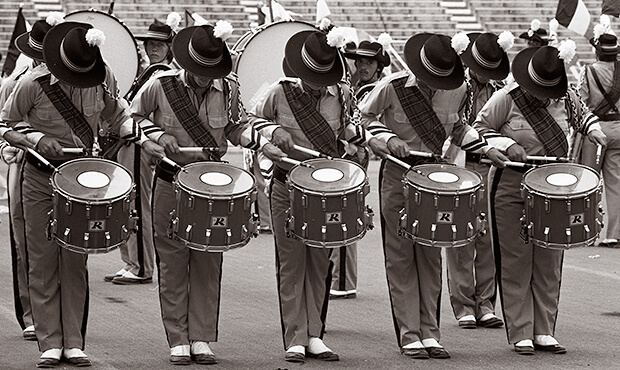 Being that March is rather late for a corps to get started on it's next production, the corps staff decided for 1980 to bring back the same music from 1979, with the only new music being a different drum solo. This week, you can save on the Legacy Collection DVD that contains this complete 27th Lancers performance, along with all finalists from the 1979 DCI World Championships. Discount DVD offer ends Monday, Nov. 3, 2014.